Editor’s Note: The following is compiled from information from the Air Force Personnel Center, TRICARE, 355th Force Support Squadron, Airman and Family Readiness Flight, Veterans Affairs, the civilian personnel office and armed forces news services. For the complete story, go to the web address listed at the end of the story. In September 2015, the Air Force Chief of Staff directed a fighter enterprise redesign to focus on developing a strategy and implementation plan to ensure the Air Force has an enduring, proficient and sufficient fighter pilot force. Senior Air Force leaders took time to discuss the topic during the annual Weapons and Tactics Conference from Jan. 9 to 13 at Nellis Air Force Base. The past 25 years of continuous combat operations has taken a toll on the Air Force fighter community. Compounding the problem since fiscal 2014, losses of fighter pilots have exceeded the Air Force’s annual production capacity. Air Force Chief of Staff Gen. David Goldfein outlined his perspective on the future of American airpower and how Airmen “deployed in place” play a vital role in today’s Air Force Jan. 18 during his discussion at the American Enterprise Institute Public Forum in Washington, D.C. Since the beginning of the Cold War, Airmen have been in a state of deployment. Today, nearly 200,000 Airmen are “deployed in place,” providing nuclear deterrence, command and control and access to space, all supporting combat missions globally. During his remarks, Goldfein reflected on the fact that since the introduction of the nuclear enterprise, no two nuclear powers have gone to war, and while conventional conflicts continue to take place, the nuclear deterrent has ensured stability. 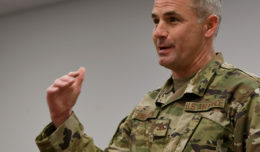 “We have Airmen right now, as we speak, defending the homeland, and that nuclear deterrent underwrites every military operation on the globe” Goldfein said. 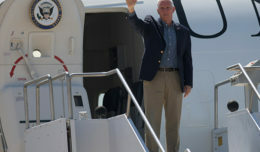 The nation’s nuclear triad is composed of three legs: nuclear missiles, nuclear capable aircraft and nuclear submarines, each essential for different reasons, and each needs to be modernized, Goldfein said as he held up an 8-inch floppy disk as one example of outdated technology the nuclear triad operates with. Goldfein went on to talk about the Air Force’s commitments to operating in space. Capitalizing on the Air Force culture of innovation, the “Make Every Dollar Count” program continues to evolve to maximize the impact of each dollar with the addition of six new initiatives. In a memorandum sent to Airmen across the Air Force, Secretary of the Air Force Deborah Lee James and Air Force Chief of Staff Gen. David Goldfein stated MEDC includes the continuation of current efforts to minimize costs, harness efficiencies and redefine legacy enterprise business paradigms. The memo also introduced six new initiatives under MEDC, including a retooling of additional duties, application rationalization, enterprise process improvement and manpower standards development, streamlining of enterprise service agreements, information technology service and data center transformation and a review of the planning, programming, budgeting and execution process. In partnership with the Coriell Personalized Medicine Collaborative, recruitment has begun for Phase II of the Air Force Medical Service Personalized Medicine Clinical Utility Study. The aim of the study is to evaluate the utility of genetics and genomics in clinical care. Phase I of the CUS took place from 2011 to 2013 and enrolled more than 2,100 AFMS personnel to provide education and training on the delivery of genetic risk information. Phase II expands enrollment beyond the AFMS to reach across the Air Force. Recruitment events will take place at many Air Force facilities in the next 18 months with the goal of enrolling 4,500 new study participants. Online enrollment is also available. 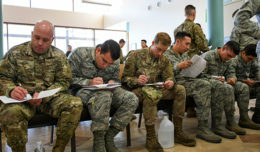 The study is open to active-duty members of the Air Force, retirees of the Air Force, or spouses of current active-duty members or retirees of the Air Force. Participants enroll in the study after they provide informed consent and a small saliva sample.